On Wednesday, Jaysh Maghawir al-Thawra and other groups of the US-backed Free Syrian Army (FSA) launched another attack against the Syrian army and its allies in southeastern Syria. According to the FSA, its members attacked government forces at the Zuluf reserve area after killing a number of Syrian troops and destroying some vehicles, including battle tanks. However, the FSA has failed to provide photo or video confirmation of the gains. Pro-government sources denied the claims. Earlier this week, reports appeared that the US military deployed a High Mobility Artillery Rocket System at its military base in At Tanf and started expanding a military facility at al Zquf. 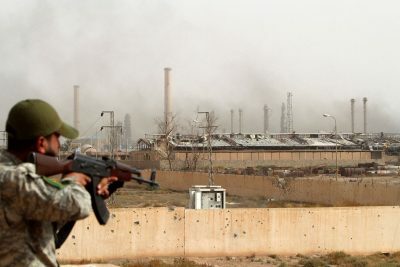 According to experts, FSA attacks on government forces in southeastern Syria is a common part of the wider US-backed effort aimed to drive the Syrian army and its allies out from the border area with Iraq. The fact that government troops had reached the border with Iraq and linked up with the Iraqi Popular Mobilization Units, was a large strategic loss for the US-led coalition. Now, Washington is using its proxies in order to test government defense lines in the area and in the best case to restart attempts to build a militant-held buffer zone between Iraq and Syria. The Syrian and Iraqi militaries responded to this effort boosting a cooperation in the border area. On June 13, the Chief of Staff of the Iraqi Army General, Osman Al-Ghanmi, met with a high-level delegation from the Syrian Ministry of Defense, headed by the Commander of the Syrian Army Operations Staff. The fight against ISIS, security issues and military coordination were the core of the meeting’s agenda. In the province of Raqqah, the Syrian Army Tiger Forces liberated the Tawhrah oil fields and the nearby points, pushing towards the village of Resafa. Clashes between government troops and ISIS members were also reported near the Habbari field. Clashes between Kurdish YPG units and so-called opposition forces continued in northwestern Aleppo. Heavy artillery and mortar shelling were reported in Basoufan and Bashmara near Afrin and an intense fighting near the village of Dara Azza. According to opposition sources, 35 YPG members were killed during the recent escalation. Pro-Kurdish sources claimed that 28 militants of various groups were killed. Some sources suggest that Ankara may be behind the recent actions of militant groups operating in the area against YPG forces. The goal is to weaken the YPG influence in the area.